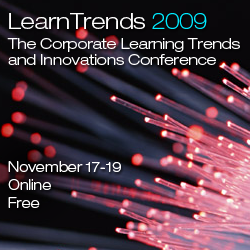 Now here's an event that should appeal to everyone's schedule and budget - LearnTrends 2009: The Corporate Learning Trends and Innovations Conference. Not only is it an online conference so there's no travel involved, it's also free! This is the 3rd conference of its kind put together annually in a volunteer effort by some very well-respected peeps in the learning industry: Jay Cross, Tony Karrer and George Siemens. Make sure to join the group and then register for the event!